Got A Hairy Back, Bro? Want something to take off that pelt you walk around with on your back? When you take off your shirt, does it look like you are wearing a sweater? Well, maybe just maybe, the Bro Shaver Back Hair Shaver is exactly what you need. Think of all the benefits of buying a shaver for your back. No more asking your brother, pal, or friends to help tame your beastly back hair. Bro, you got this; you got this. Take the next leap in manscaping, and do it yourself. Bro, handle it yourself like real men do. You longer have to go to a girly salon to get tortured by getting your back waxed. There are more options these days and shaving one’s own back is a definite choice to consider. What Is the Bro Shaver? The Bro Shaver is a shaver designed for a person to shave his own back with it. 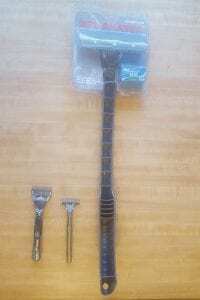 It comes with a long, curved handle that has a shaver head, which allows for easy changing of double edge safety razors. These blades are pretty cheap to buy and do a good job of cutting hair. The head of the shaver takes up to three razors for a wide shaving range. These blades fit precisely into the available slots to provide continuous coverage over the 4 1/2 inches in which they cover. There are three knurled knobs which are un-tightened or tightened easily with your fingers. Also, on the head of the shaver is a row of plastic teeth that act as a comb to corral long hair before the razor cuts it. This makes shaving the longer hair possible and easier. The Bro Shaver is a whopping 20 inches long, with just enough curve to it. This allows the Bro Shaver to easily hit the hard-to-hit spots. The cutting edge is about 4 1/2 inches wide. Three double-bladed safety razors are precisely positioned, side by side to give you this width. Not sure of the weight of this, but it is very light and very maneuverable. How Does Bro Shaver Preform, Brother? I wanted to see how Bro Shaver performed, both wet and dry. So, I hit one side of my back dry and the other side after a hot shower. I noticed a couple of results from my experience. I discovered that shaving dry, I was slightly more prone to nicking myself, as opposed to properly preparing my back for a shave (for whatever reasons they may be). In both tests, the hair came off easily, and through both tests, the razor still remained extremely sharp. The Bro Shaver gave me a really close shave that left me feeling very satisfied with it. I took my time shaving my back, as I was aware this method wasn’t idiot proof. I realized I could easily cut myself being careless. I had some experience of shaving with a straight razor on my face, and this helped, but it’s been awhile for me. Slowly, you pull the razor in a very straight line, without any motions to either side. Failure to do this will result in cuts and nicks on your skin. I really love that I can use replaceable blades; they are cheap and plentiful. They can be flipped (double-sided) or changed out pretty quickly when they get dull. Three packets of five double bladed razors are included for a total of 15 replaceable double safety blades. Plus, a pack of 100 is relatively cheap. This should last a very long time, no matter how much hair you grow on your back. More bang for your buck, as they say. Closest shave by far. A great shave. Long, long, long handle. 20 inches from tip to tip. I was able to get to all of my back easily with it. Longest handle to date that I have reviewed. Had zero problems with hair clogging this razor. The hair just falls away. A hole at the end of the handle to allow for easy hanging, or you could attach a lanyard as well. Easy and fast to change blades out. Unscrew three nuts with your fingers and flip or swap the blades out. Bingo Bango Bongo! The blades supplied cut right through the hair and are sharp! Leaves a mess of hair on the floor in its wake. Love the fact that once you buy the shaver, you are not dependent upon a specific company for the replacement razors. As beard razor companies are notorious for jacking the price of replacement blades up and up and up. I’m looking at you, Gillette and Schick. The angle that the shaver is set at seems like a good angle, and you don’t have to adjust your wrist placement that much to get a close shave. Does a cooler name exist? I think not. Handle seems strong and light, with a little side to side flex, but very little flex up and down. Bolts and nuts are stainless steel and nickel, and shouldn’t rust on you. Within the instructions, a support email is given for any questions you may have. So, if you are experiencing any problems after buying it, contact the number to see if there is a solution to your problem. Works well…should come with a little broom and dustpan to clean up the caveman pile of hair left around your feet. Great for the hairiest of the beast out there. If you are hairy and it grows back quickly, this back shaver would be hard to beat due to your near-constant upkeep of taming the silverback. A high margin for error. I think of the Bryan Adams’ song, “Cuts Like A Knife,” a really sharp knife that is when I first think of the negatives of this shaver. I took my time and concentrated as hard as I could, but still managed to open quite a few spots on my skin and leaked a little ruby red. Not a deal breaker, but this Bro will cut your back instead of stab you in it. It’s a lot like shaving with a straight razor. I think I would become better with time at shaving with the Bro Shaver and eliminate most of the nicks and cuts over time. Slight discomfort afterward from shaving–skin irritations as well as cuts. This feeling left the next day. Adult usage only. Sorry kids, no shaving your Dad’s hairy back (Darn!). Steady hand need apply. The handle has uncomfortable angles on it, as one side is smooth and comfortable, and the other is open and unrefined. A sharp edge that feels uncomfortable in my hand. Cheap handle comes to the mind as far as manufacturing is concerned, but doesn’t seem like it would break during use at all. They need to improve the handle in 2.0. Choking up on the handle is also uncomfortable. No instructions included in the packaging. Instructions are sent via email, and it’s within an attachment (a PDF file). I hate opening attachments in email programs. However, it’s worth the read for sure; it even made me chuckle. The instructions say to store the Bro Shaver without the blades installed. Bummer, but safety first, right? This should come with some leather sheath or something, so this wouldn’t be necessary. You could just wrap it in an old sock after cleaning it if you don’t have kids around your house. Also, see tip below. 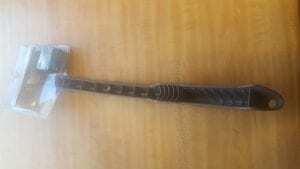 Example of the uncomfortable hollow handle. Needs to get ergonomic on both sides, Bro! ***Important*** Read and follow the directions before shaving. This is important to get the best and most comfortable shave. Also, follow the back preparation as detailed in the instructions. This includes cleaning your back with soap in a hot shower for at least 15 minutes. I recommend using Voda Reve Exfoliating Loofah Back Scrubber as this easily reaches your whole back and works quite nicely. I wrote a review on the Voda Reve here, Voda Reve Review / Good Back Scrubber? My number #1 tip on using this bloodthirsty shaver is TAKE IT SLOW. Take three deep breaths before defoliating your back forest. Be prepared to take it slow: S –L–O–W D–O–W–N because it is pretty easy to cut yourself. Do not attempt to shave your wolf hair if you are in a rush. Allow plenty of time to yourself to get the job done. Use straight, perpendicular strokes to the razor’s edge. Try to not move side to side when shaving, just straight strokes. 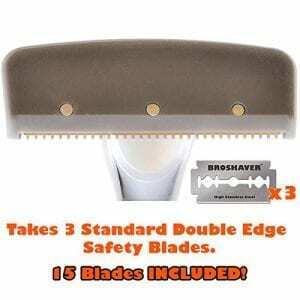 Bro Shaver recommends two types of replacement blades, FYI. Astra Superior Platinum Double Edge Razor 100 blades for the new shaver & Feather New Hi-Stainless Platinum Coated Double Edge Blades for the experienced shaver. Another tip is if you’re planning on showing your back publicly, give your back skin enough days to recover from the minor nicks and cuts you may incur when shaving yourself with this weapon. At least after your first shaving endeavor. Shave with a wet back (as per instructions). I tried both methods, and I definitely prefer shaving with a wet back with the Bro Shaver while using a good shaving gel or cream as well. If you’re going to shave your back dry, at least do it after a proper shower–you filthy animal. Bro, please clean up after you’re done. Bro…nobody likes walking in back hair. You beast. If you are carefully opening the bottom of the packaging that comes with Bro Shaver, just cutting the bottom of the plastic, you can reuse it to store your Bro Shaver, without having to take your razor blades out for storage. As per the instructions, that say to remove the razor blades before storing it. This is due to safety reasons, as you can cut yourself if the blades are not covered. But you should also clean the shaver before putting it away. Expect there to be a learning curve using this shaver; you will get better, the longer you use it. If you are familiar with using straight razors or safety razors, you will already have an understanding of how these types of blades work. Modern razors typically don’t cut you as easily as straight and safety razors. Do you get an idea of how big this is? 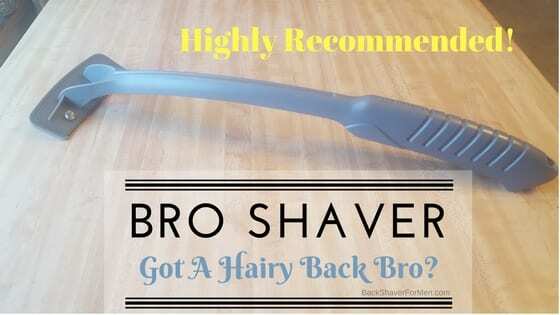 Overall thoughts on the Bro Shaver Back Hair Shaver–it’s a damn good, cost-effective method of shaving back hair. This surely works, as the day is long. It works so well, however, you must be conscious and careful–paying strict attention to how you use it. I equate this to shaving with a straight razor, but with a slightly less risk involved. The more you shave with Bro Shaver, the better you will become (I believe this). Just follow the instructions and take it slow. The two biggest benefits of Bro Shaver are the low cost of replacement blades and the fact that it works! This combination makes the Bro Shaver a serious consideration if one is looking for a back shaver, especially if you love saving money in the long run. This is by the far the cheapest replacement blade back shaver option on the market and is a real selling point for the product. A great shaver, for even the hairiest of men. Bro Shaver will most definitely help you gain control over your back hair and is very economical, too. Multiple nicks when shaving with this.